In the winter of 1969 I wore pants (sewn by my mother) to school for the 1st time. Mrs. Matossian, my 5th grade teacher sent me to Mrs. Sullivan’s (the Principal), office for coming to school dressed inappropriately. 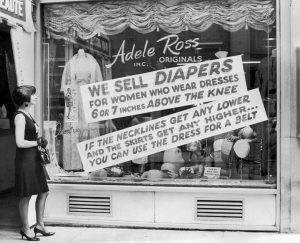 The next day, my mother sent me back to school in a new pair of ‘slacks’ with a note citing the School Dress Code for New York State allowing girls to wear pants. This was the only time in my entire educational experience that I was sent to the Principal’s office for a disciplinary reason. 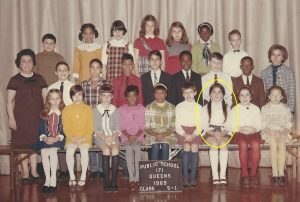 My 5th Grade class photo with Mrs. Matossian on the left. Mrs. Matossian, who was usually very sweet to me, did not respond very well. After ‘the incident’, Mrs. Matossian became curt and did not call on me as much. I was hurt and confused. We girls would have to walk to school in the middle of winter with our snow pants on and then remove them in the coat closet before class began. This was embarrassing and a challenge in the cramped, dark closet! In February of 1969, New York City had one of its worst blizzards with 9” of snow, so walking to school only in tights and boots would not be prudent. It was after all, 1969! 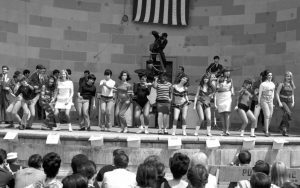 Think of what was going on in fashion: mini-skirts, go-go boots, and fishnet stockings! How could a pair of slacks be more provocative than that? These were modest slacks, by the way, not elephant bell hip-huggers. This was also a public school in New York City in 1969 – the year that Neil Armstrong and Buzz Aldrin landed Apollo 11 on the moon! (I shook Neil Armstrong’s hand in a parade celebrating this achievement!) 1969 was the year of Woodstock and President Richard Nixon and protests against the war in Vietnam. From the perspective of 11 year old Wendy, I was conflicted. I really wanted Mrs. Matossian’s approval – really! I strove to be the teacher’s pet by erasing the black board, handing out materials, and raising my hand from the front row of the class as frequently as possible. I also really wanted to be be comfortable and not have to get in trouble for that. I lived in a world that was changing rapidly and under restrictions that did not affect my six brothers in the same way that they affected my two sisters and myself (our six half siblings were older and so, were not part of this transition in the same way). My father almost killed my older sister for cutting her hair in a short ‘pixie’ style. We girls were supposed to have long hair and wear clothing that was not provocative. He was born in Ponce, Puerto Rico in 1902 and had antiquated ideas about women’s rights, but his ideas were common in New York City in 1969 as well. My mother could not get a credit card in 1969 without her husband’s signature – even though she was the one with a job who supported our family. I also wanted to honor my mother’s efforts to gain whatever freedoms that we could including, the freedom to dress as we pleased. In time, Mrs. Matossian not only relented and ceased her retaliation, but her comment on my final report card indicates that she forgave my challenging her authority: “ Wendy is a wonderful person. It was a pleasure to have her in the class. She will certainly succeed in all her endeavors.” So, I was affirmed by getting the approval of a favorite teacher and, I like to believe, who was empowered by the progress that my generation fought for. One giant leap for woman kind! I was inspired to share this piece of my history by the UN Women post “Five Innovations That Have Advanced Women’s Rights” I hope that you are inspired to share some of your own history! Let me know about your ‘firsts’. These achievements in our own lifetimes need to be recounted and recorded so that those who are struggling for access to full emancipation and empowerment are encouraged to persevere! Helping Organizations to Intentionally Advance Diversity, Equity, and Inclusion! ← Announcing Inclusion Strategy Solutions LLC! Announcing Inclusion Strategy Solutions LLC! The Process, Part 3: All Aboard! Now What? The Process, Part 1: Inclusive Recruitment Is NOT Affirmative Action! Wishing You a Year Filled with Diversity and Inclusion! There is NOT an APP for that!